In our second installment from Kevin Buckland, our Guest Editor based in Barcelona, we learn about Cooperation Jackson. Cooperation Jackson is a project that is building a circular and sustainable local economy in the “Deep South” of the United States. Its holistic organizing practice that brings together open “People’s Assemblies”, participatory city budgeting, a community land trust, inter-connected worker, farming and (eventually) housing co-operatives in a way that begins to model what a scaleable just transition could look like for urban and semi-urban areas. Today I sat down with Sacajawea (“Saki”) Hall and Kali Akuno – two founding members of Cooperation Jackson to talk about the intentions, practice and future of their revolutionary project. K: Hello Kali and Sacajawea, thank you for meeting with me to talk about your deeply transformative project: Cooperation Jackson. Since you began Cooperation Jackson in May 2014, a lot of hard work has been done. Could you tell us about the main goals and intentions behind Cooperation Jackson, and why you chose Jackson, Mississippi to begin? Saki: Being able to create a solidarity economy in Jackson Mississippi, because its something that’s needed throughout Mississippi and throughout the United States. We are focused on the African community in the US, which means that the deep south is very important to the work we are doing, and seeing that able to spread. We are explicitly being anti-capitalist, although in practice I think we could be doing better about talking about and institutionalizing feminist practices and explicitly enact a feminist economy. I think that because we are talking about moving away from a capitalist, individualist, profit-driven economy – than that sets the tone for it to be a caring economy. But this doesn’t automatically make it happen, as we need to be explicit about dealing with patriarchy. So this is one of our principles, along with using a human rights framework. So we are looking at not only solidarity but also sustainability, ecology and developing workers cooperatives that are producing in sustainable ways and talking about, and developing, practices and institutions that can spread a culture of consumerism that looks at not only production but consumption and how we can do that in sustainable ways. 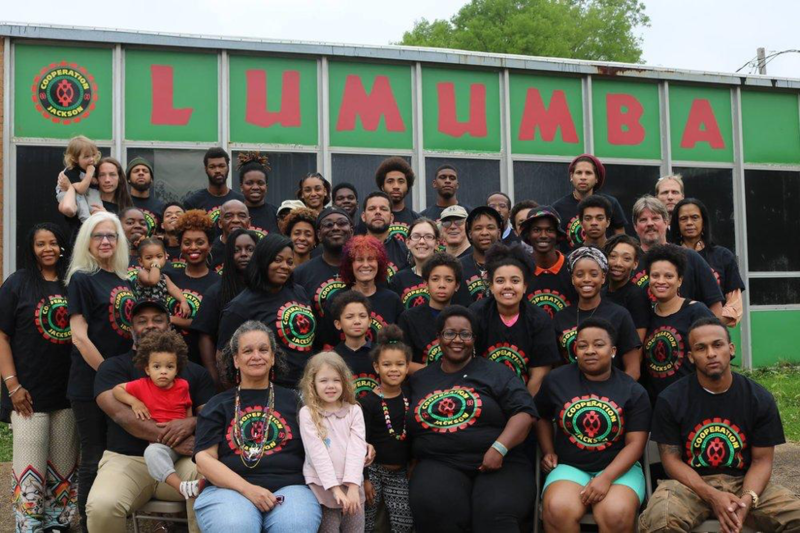 Kevin: This seems like very important work, addressing both the economic and social impacts of an unsustainable growth economy – could you say a little bit about some of the worker cooperatives that have been a core part of building “Cooperation” in Jackson? Saki: The land that was first purchased for the Center for Economic Democracy and Development was so ripe for agriculture that Freedom Farms was one of the first projects we developed. This was based upon recognizing both the need and interest. From the beginning, we brainstormed what type of worker cooperatives we could start off with, and we started with a functioning catering coop that now hopes to open up a cafe and Community Grocery. Another cooperative is around waste management – recycling and composting. Which has become “The Green Team” which is doing landscaping and composting the refuse from cutting lawns and trees, and then another opportunity that presented itself is the Community Production Center and the Community Production Co-op, which is focused on new technologies like 3D printing and so we were able to acquire another center for a Fab Lab and Maker Space. 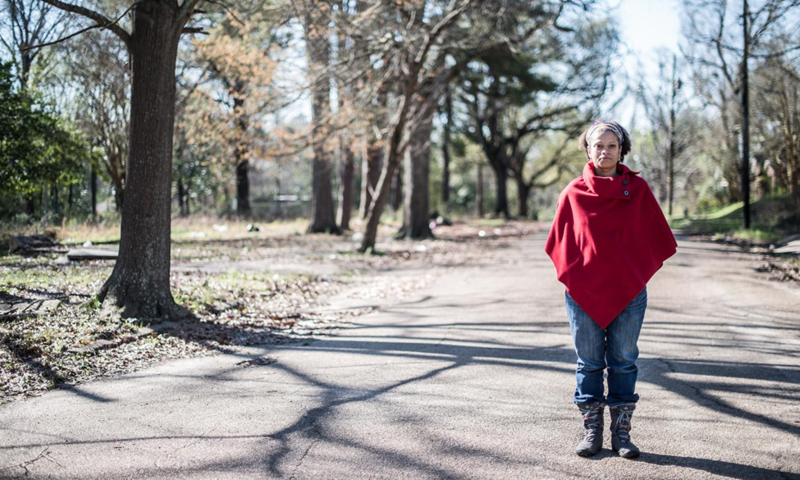 Kali: Our arts and culture coop, Revolutionary Resonance, we’ve been doing some cultural events, and there is already a strong arts and cultural, especially visual arts, culture in Jackson that need more room to express itself. So people have been talking about having raves in parts of the building that we aren’t ready to expand to yet. And having arts shows, and inviting others from the community in. Kevin: It is wonderful to see how ecology is influencing the means of production: creating local, circular co-operative economies where the compost cooperative, helps the farming cooperative, helps the community grocery, and so on. Could you also speak a little bit about the sites of production, and the importance of autonomous spaces? Saki: We are positioned in a part of West Jackson that is right near Jackson, we identified this would be a sight of conflict as the “development” of downtown encroached upon West Jackson. So it was important for us to recognize land and the role that land plays in determining self-determination and sovereignty. Especially while the land is very inexpensive, so looking at how to create a Community Land Trust was something we started in our second year and now we have the Fanny XXXX Community Land Trust. In the short term looking at expanding Freedom Farms into other vacant lots that we as an organization own, and building out the leadership body with members of the neighbourhood… and the development of cooperative housing. So very much thinking about how we make use of the land, and doing it in a way that eventually includes housing but doesn’t do away with the farming or other projects and replace it with housing – so how do you incorporate the housing into community’s spaces? But it is very challenging for community groups to do their own housing developments – so this is something longer term for us. Kevin: What do you see as the future or direction for the community land trust? Saki: I think the next phase for evolving the community land trust is involving the neighbourhood and everyone who lives there in visioning: “What is it that we want to see here? What don’t we have, why don’t we have it? What do we need what do we want to have, and how do we do it together?” What is exciting is about being able to use the Fab-Lab and the technology to create buildings, amphitheatre, playgrounds or housing with that technology – which can be done at a lower cost than can usually be done. And this is an exciting way that people can get involved with laying out what it is they would like to see. Also, we have Ewing street – which has three actually structures and the rest has been taken over by nature, and we own about 3/4 of that block. So looking at that as a pilot eco-village on that land, and then how do we expand out. How are people able to live and work in their communities while having social and cultural spaces that are able to maintain the wealth in the community instead of having it extracted in the way that it is now? Kevin: I know that this much work doesn’t come easily, could you talk a little about the organizing structure behind Cooperation Jackson – and how this structure can itself be seen as part of the political project? Saki: The structure of our coordination committee, where the day to day decisions, strategy and planning come from the Executive Committee and the goal is for that to be completely taken over by the membership through annual membership assemblies. We still need to reach that level of horizontality, although in the last two years we have been able to expand beyond the executive committee to a leadership body that receives support in order to really move the coop work forwards. Kali: This year we have committed to experimenting to having a division of labor which is one group that is focused on the development of the co-ops themselves and there is another group of people who are focused on outreach, community organizing and base building – so there is a very intentional division of work that we are experimenting with to see how it works over time. … We are re-tooling and part of the reorganization we are experimenting with – which is one of the beautiful and difficult things about having a horizontal organizing model – is that it can be flexible and adjust to meet different needs, and you can experiment. Kevin: I know Cooperation Jackson functions on difference levels – both grassroots and through pressuring a city government that can be both ally and adversary. Could you talk about the project of participatory “Human Rights Budgeting”? Kali: This is a way that we are trying to both reach, but also have a direct material impact on people in our community, to scale. Trying to struggle with the municipality to allocate, atlesat 25% of total budget to be allocated to a Human Rights budgeting or Participatory Budgeting framework. In order to change the priorities and deal with the financial shortfalls and financial crisis in our city we need to prioritize human needs. And we think that if we can do that, we can deal with austerity in a way in a direct manner. For us, an original aim was to increase social spending in the city by decreasing the amount of money that would go to the police. Part of the theory was that if people were proposed in a democratic manner: “Would you like more money for afternoon childcare social services, family services, health care or police. Most people would choose the former. Kali: But you need to do the consciousness raising and the institutional change that would make a decision like this possible. So that is somewhat a task of how we are looking to have a direct and immediate mass impact on the community that goes beyond our own membership. There are some things we are trying to develop Cooperation Jackson as an institution, an others to influence the city. Kali: People’s Assembly should be regular and a space where people from the community can come and raise their demands and self-organize ways to resolve those issues. The transition assemblies are more thematic focused, whereas the People’s Assemblies were open and people come to address their needs. Saki: Because the important piece are the solutions, and how the solutions are different when you have people who are most directly impacted engaged in the visioning of the solutions and talking about the actual impact of the problem, both being able to do what we are calling “Build and Fight”. Both being able to hold people accountable to have policy shifts that support that, but at the same time be able to self-organize and create those things. Kali: And trying to make a clear distinction between things that we have to ask the government to do and things we can do for ourself. The theory was that through the practice, and people learning the practice of participatory democracy, we would eventually be able to, to use the old phrase, “wither away the state”. That was the original model that myself and many people who were tasked with theorizing about the People’s Assembly a decade ago, thats what we set in motion. This process grew principally out of visits to the Zapatistas, where we saw elements of that in motion, to just self organizing communities where there is no functioning Mexican state and there wasn’t before the uprising, and they have succeeded in moving it back. So we are trying to get it back to that point, recognizing the differences in our situation. We are in the United States where, I would argue, the state is everywhere. It has a very ominous way of being nowhere and everywhere at the same time. With the Transition Assemblies we started with a theme: that we are intentionally trying to transition to another system, and we are trying transition from thematic issues to a broader people’s assembly. Ours had very much been situated on “how can we transition the resources of the city in a more demoractic way”? Which is why we started with the Human Rights budgeting for our first two Transition Assesmblies. Both of them had about 30 people in them, and 30 people cannot claim to represent 200,000 – and, in my opinion, 30 cannot be making decisions for 200,000. So the question becomes how do we take that 30 and make it 300, how do we make that 6,000. So thinking about it from an organizing perspective as a multiplier effect. – Where do we start, how do we grow, where do we scale up, and what are the tools and methodologies we need for that. Community Members gathering in front of the Lumumba Center in Jackson, Mississippi. Kevin: Whats next for the Transition Assemblies? Kali: A group has just finished a needs assessment, which will be a good first expression of the community by asking: “what are your healthcare needs? What are your job needs?”. Since its an open process we will learn more by doing it, and I think that will be the next critical process- how do we assess the real needs of people? And this is the Human Rights framework, that is constructed around the needs of the people rather than locked into an existing framework, which is how most budgets get done. The next phase is for the rest of the summer, people are getting out and doing door knocking and getting people to participate in the assessment. For younger people, we asked people to come up with a mobile app survey… so its moving! But its that type of intended, broad, people’s participation and engagement – which is critical to making an assembly and is also critical towards reaching and politicizing people to be agents of their own self-transformation, which is what we are aiming for. Jacajawea Hall, a founding member of Cooperation Jackson.